A packet of kippers needs to be cooked all at once, especially when you have you use the boil-in-the-bag method because the microwave is no longer an option (since it caught fire). But that is all good when there is also a bit of left over cream cheese and some horseradish in the fridge. Just blend together to your taste and serve with toast : hot buttered, grilled pita or what ever you might like to use to make a fabulous nibble from a load of leftovers. 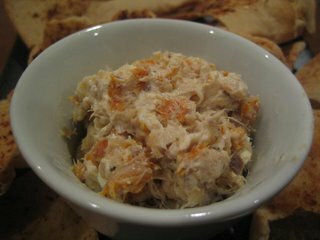 I make a very similar recipe with smoked mackerel - just flake the fish and mash it together with Philly cream cheese (calories be damned!) - and I also add some finely chopped spring onions and substitute lemon juice for the horseradish. Mmmmmmm!